A Call to College would not exist without its dedicated volunteers. Below is a list of just a few of the ways you can help. All recipients are expected to volunteer up to four hours annually for A Call to College. This assistance provides an opportunity for participants to pay forward their appreciation of the program and its generous donors. College Talk (Dec. 14, 2017) College students are invited to return to Newark High School to talk with juniors about their experiences. Small group discussions and question and answer session help juniors become more comfortable with the college process by talking directly to alumni close to their age. Graduates also benefit from sharing experiences and offering advice. Contact Julie Uible at 740-670-7424 for more information. 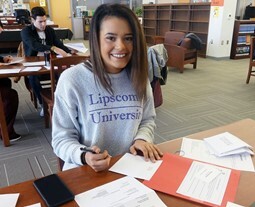 Grads Give Back (Dec. 18, 2017) Recipients return to write notes to donors and other supporters, thanking them for their dedication to the program. In addition, volunteers help complete specific office tasks, providing vital extra hands and time to large annual projects. Contact 740-670-7424 for more information. Reading Rocks at the Library (Tuesdays, Oct. 3, 10, 17, 24, 31; Nov. 14, 21; 9-11 am; Licking County Library, Downtown Newark) College students interact with second graders during a special story hour where a Guest Reader brings the inspirational children’s book, The Little Engine That Could, to life. In addition to talking with the children about the book and its lessons on determination and persistence, the college volunteers also serve as college role models. This activity is great fun! For more details, contact Shannon Chiacchira or Jen Anthony at 740-670-7424. Special Assignments Recipients who want to fulfill their service hours, but cannot attend any of the opportunities described above, should contact 740-670-7424. One-on-One Advising (throughout the school year) Trained advisors work with juniors and seniors to guide them through the testing and financial aid processes. For more information about what this volunteer position entails, click on the link below. If interested, please call Sue Kent at 740-670-7424 for more information. Nearly 50 former Wildcats and current Last Dollar Grant recipients participated in Grads Give Back.